Being in the first row also meant that we were one of the first few to get out of the plane into the very empty Denpasar Bali Airport… And we all got lost after stepping off the aerobridge! The airport looked new and very deserted… The nearest escalator pointing to immigration was actually leading to a mess of renovations. The only possible path was the walkway to the left but there was a barricade and the whole lot of us all were not sure if we should proceed. One Caucasian lady commented that this was actually quite an adventure… Haha! Finally, an official appeared and nodded towards that direction so everyone started walking again… And we discovered an opening at the barricade… 😀 That led to the immigration! Yeah! We were the first tourists that did not require visa-on-demand, so we cleared immigration in less than 5 minutes 😮 We also did not have any checked in luggage, so all we had to do was to wait for the officers to switch on the X-Ray machine at the Customs to scan our hand-carry luggage and we actually got out by 9.35am, the time that we were scheduled to land. I guessed we were too early; our driver was nowhere in sight! We were also quite confused by the hidden exit… Apparently you have to pass through the duty free shop in order to get out of the airport, very clever! We got into the car around 10am and were offered cold scented towels to freshen ourselves and chilled bottled water to drink, which we thought was very thoughtful! Along the way, the driver would try to point out several interesting sights and explained some stuff to us. 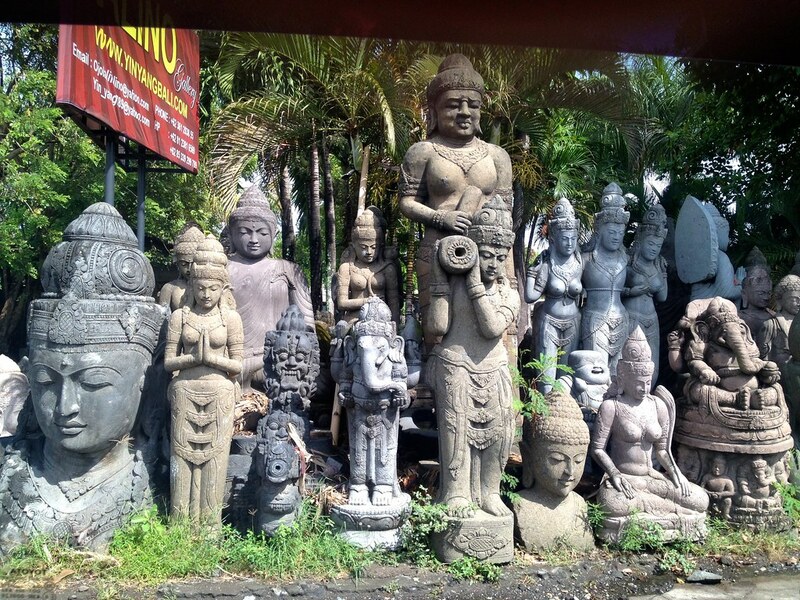 We saw many huge stone carvings! 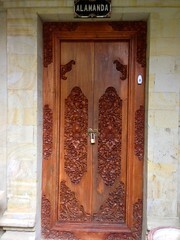 We were told that 90% of the Balinese were Hindus, hence many of the carvings were of the Hindu gods. It was a 1.5-hour ride to Ubud and we were so happy when we finally arrived at the resort! Welcome drinks and delicious tempeh! There was a pavilion at the car park where we were once again given chilled scented towels to freshen up, before being brought to our villa, Villa Alamanda! There was no reception area in this resort, so you either check into your villa directly, or you will be led to the dining area (Pondok Restaurant) to wait if the villa is not yet ready. 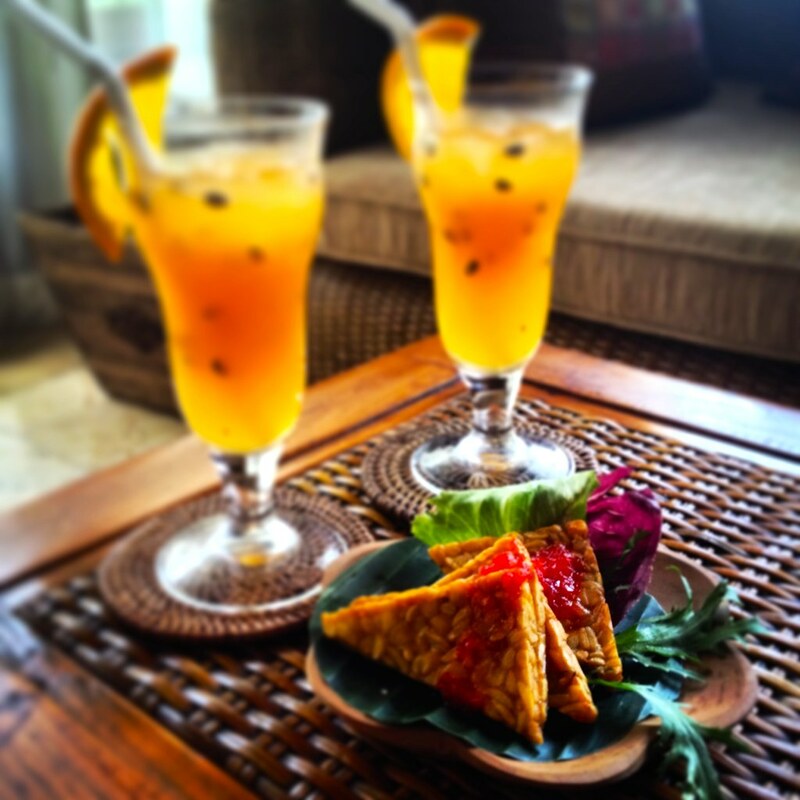 Usual check-in time is 2pm, but we arrived around 11.30am and were able to go to our villa directly; 30 minutes for us to look around the villa, drop our bags, enjoy our welcome drink of passion fruit and tempeh snack, and go for our spa scheduled at 12noon! The Angel Realm spa treatment was part of the package, and it started off with a warm foot bath, while we sipped tea and listen to the therapist explained the process of the treatment. She then applied the 4 available aromatherapy oil blends on our hands before asking us to choose our preferred oil blend. We picked the third one because it was such a lovely and refreshing scent! After we had made our choices, two therapists proceeded to give our feet a good rub. 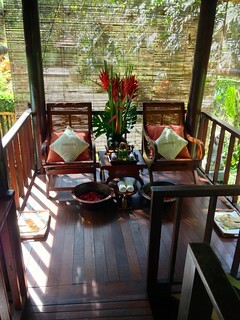 We were then led to the second pavilion to change and get ready for our massage. It felt a bit strange at first that we were expected to undress in the open, while the therapists continued to prepare for the treatment. But the pavilion was absolutely hidden by the trees and shrubs, so no one outside could peek in, and the therapists were too busy to look at us change anyway, haha! We loved that the pavilion was so near the river, so we were lying face down, with our eyes closed, and just listening to the sounds from the river and the nearby waterfall, while enjoying the cool breeze… Very lovely and relaxing! The massage was one of better ones that we ever had! We fell asleep while the therapists worked with their magic fingers. After the massage, we were led downstairs for the Lulur scrub. A wet paste consisting of turmeric was applied, and after it dried out, was rubbed off our bodies, giving our bodies a good scrub! Next, a wet mixture of avocado yogurt was applied to nourish our skins. After a rinse, we were then led to the warm flora bath. We loved the flora bath! The tub was just next to the lotus pond, and surrounded by all the greenery, with the waterfall nearby. 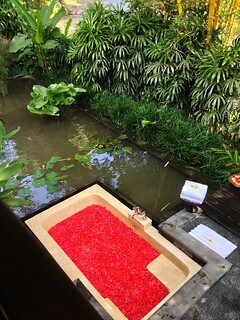 Very relaxing to just soak with the sweet-smelling red petals of flowers surrounding us, with the cool breeze against our face, and our bodies kept warm in the water! There was also a delicious platter of snacks of tempeh, chicken drumlets and popiah in case we were hungry after the treatment. We were not chased out despite exceeding the allocated time, and were simply left alone to enjoy our time together. 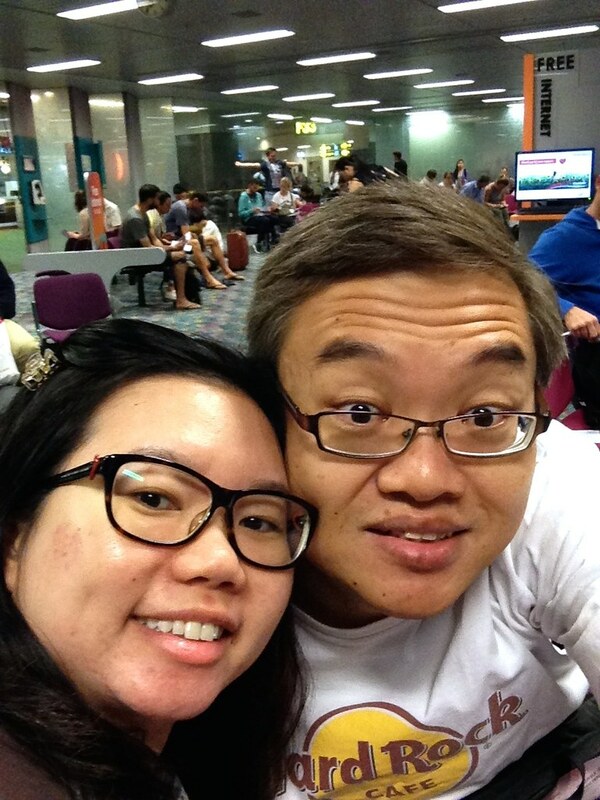 We felt so refreshed after the treatment! Too full for lunch, we decided to go soak in our pool! But alas, the water was freezing cold. Nevermind, there was still the main pool 🙂 The water was cold too, but not as bad, and the view was very lovely! The deep end of the pool was as deep as my height; thankfully there was a ledge that I could step on. We had the whole pool to ourselves and it was close to 4.30pm when we finally got out of the pool to enjoy the free tea break by the pool side – banana cake with coffee and tea. Luckily the sun was not baking hot, and we had a great time! We were worried that Bali would be as hot and humid as Singapore, but so far, the weather had been lovely! This was also the first time we met the owner, who shared with us his favorite spot in the pool to have a drink, gaze at the river, and sometimes spotting naked ladies at the river… Haha! First, we had a small popiah for appetizer, which was quite similar to what we had during the spa treatment. Next was a basket of freshly baked bread, followed by soup, which was a bit like mee soto soup. 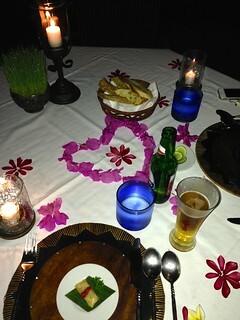 Then came the main course, which was a platter of prawns, duck, meat skewers with lemon grass and tempeh. The grilled prawns was done just right and was really really delicious; the meat skewers paled in comparison. The duck was very crispy! Rice and crackers were served by the side, and we really liked the crispy and slightly bitter crackers! Dessert was ice cream with sago. The sago had a good chewy texture but the ice cream was far too sweet for us. As we ate, we also had time to enjoy the lovely night. Because it was so dark, the stars seemed to be shining so brightly 😀 Halfway, the owner popped by with his cat, Kimi, and shared more stories of vipers 😮 Not very romantic, but we found his stories quite hilarious sometimes… Hehe, so quite ok lah! We returned to our villa fairly early, and just nua-ed at the couch while enjoying our good night chocolate cakes and newspapers (kinda strange to have newspapers delivered only in the evenings). We KO-ed pretty early today; the bed was quite comfy, after I managed to climb up (why was the bed frame so high?? )… Haha! As you know, the Indonesian Rupiah is a very huge currency so you will be dealing with a lot of zero’s, especially in your head. Some restaurants don’t even bother to list the last 3 zero’s in their menu. 🙂 One easy way for us to convert is to disregard the last 4 zero’s. So Rp100,000 would be equivalent roughly to S$10. After you exit the airport immigration and customs, there will be a long line of drivers with place cards waiting for their clients. There are so many of them, sometimes its easy to miss. Do also remind your villa/hotel (if they provide airport transfer service) on your arrival time. But be prepared to wait, especially if you are like fortunate us, who whisked through immigration and customs in a record 20mins. Even the owner was exclaiming ‘Amazing!’ when he heard of our experience. There is free wi-fi at the airport. Villa Semana – Highly recommended if you are looking for a secluded villa away from the crowd. You can read our review on TripAdvisor!